Loan growth for domestic lending picked up from 5.1% yoy in August to 6.2% yoy in September. Growth in low-cost savings and demand deposits was healthy at 7.8% and 4.5% yoy respectively. Growth in foreign currency loans was also robust at 10.3% yoy. Interest rates should be marching higher again as the US Fed is widely anticipated to hike Fed funds rate by another 25bp in Dec 17. 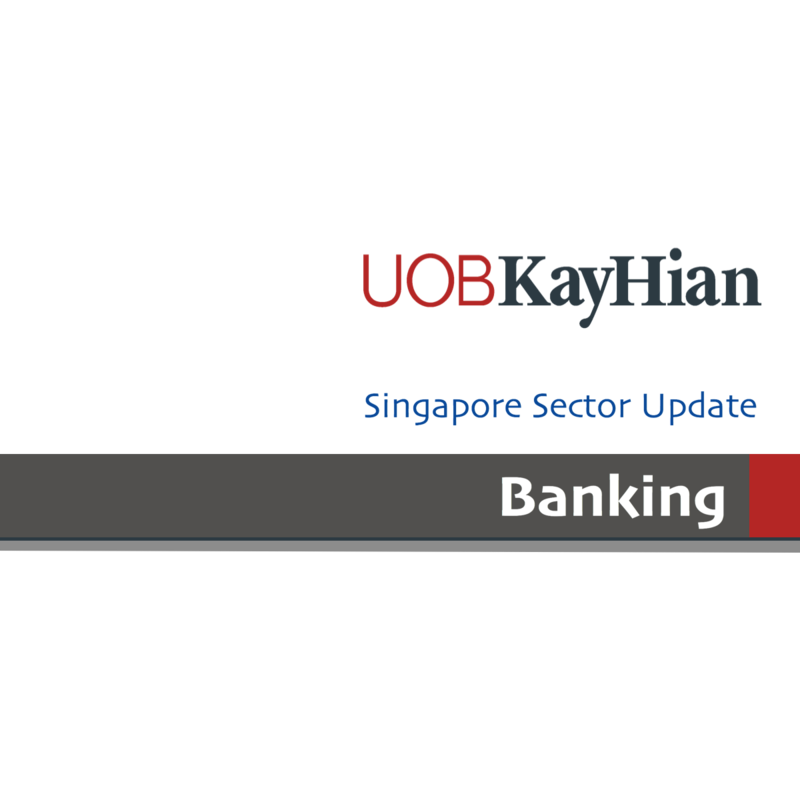 Our top pick is OCBC, followed by DBS. Maintain OVERWEIGHT. For domestic banking units (DBU), loans grew 6.2% yoy, a slight pick-up from 5.1% yoy in Aug 17 and 1% mom in Sep 17. Growth was driven by loans to businesses which saw an 8% yoy increase (general commerce: +16.4% yoy, business services: +22.2% yoy and non-bank financial institutions: +15% yoy). For consumer loans, housing loans and car loans grew by 4.2% and 4.4% yoy respectively. Deposits grew by only 3.5% yoy, driven by 7.8% yoy expansion in low-cost savings deposits and 4.5% yoy growth in demand deposits. For Asian currency units (ACU), loans expanded by a robust 10.3% yoy while deposits grew by a slower 4.4%. Loans to businesses increased by a stronger 12.1% yoy. Interest rates on the rise. 3-month SIBOR was stable at 1.13%. 3-month SOR has caught up, gaining 0.11% mom to 1.06% in Oct 17. There should be further upside to SIBOR and SOR given that the US Fed is widely anticipated to hike Fed funds rate by another 25bp in Dec 17. Yields for 10-year and 15-year government bonds have increased by 13bp compared to 10bp for shorter dated 2-year government bonds. The normalisation of central banks’ balance sheets coupled with resilient global growth could energise banks’ share prices and lift their valuations towards and above their mid-cycle valuations. Deregulation for banks and efforts towards reducing the corporate tax rate in the US also add to the positive sentiments. Downsizing of the Fed’s balance sheet and more interest rate hikes in the US are positive for DBS due to its strong deposit franchise with high CASA ratio of 90.4% for Singapore dollar deposits. Management has completed the review of DBS’ dividend policy. Interim dividend for 1H17 has increased from 30 to 33 S cents/share. DBS has exposure of S$3b to 90 smaller offshore support companies. About 60%, or S$1.8b, of these smaller accounts are deemed vulnerable, which could result in new NPLs and higher specific provisions in 2H17. Our target price of S$24.48 is based on 1.27x 2018F P/B, which is derived from the Gordon Growth Model (ROE: 9.9%, COE: 8.0% (Beta: 1.1x) and Growth: 1.0%). OCBC NISP was the star performer with earnings growth of 23% yoy in 9M17. Loans grew 17% yoy while NIM was attractive at 4.5%. Easing of pressure on asset quality from the O&G sector.